Water damage from leaks in metal buildings is both costly and annoying. Whether purchasing a pre-engineered metal building for your own personal use or for a commercial or industrial enterprise, you want one that won’t leak. Not only do leaks cause damage to a steel structure over time, they can also damage the contents of the building. There are two basic types of leaks in metal buildings: Weather-related leaks penetrating the building from the outside and condensation leaks originating inside the structure. This article will discuss preventing weather-related leaks. Don’t be fooled. All metal buildings are not alike. The number one way to prevent leaks in prefabricated metal buildings is to purchase a quality steel building system in the first place. All RHINO’s prefabricated steel buildings are designed to provide the best protection available from water damage caused by heavy rains, high winds, snow, sleet, and hail. You can avoid costly water damage by eliminating typical leak paths when constructing the building. RHINO’s standard steel building package includes seven features which will keep your metal building snug and dry for years to come— without any additional cost to you. RHINO metal buildings are manufactured with 100% commercial-grade rigid steel framing. RHINO-tough steel framing stands up to Mother Nature at her worst. Each building is designed to meet or exceed the local building codes for wind resistance, seismic ratings, and snow loads— for the lifetime of the structure. All cutting and welding is done at the factory rather than at the job site, so you are assured of strong connections which won’t break in weather extremes. The steel building components typically are attached to the foundation by ultra-strong steel bolts. Individual framing components are connecting use high-strength steel bolts. Insurance reports show the roof is the primary culprit when a building fails in extreme weather. High winds will find the weak spot in a roof. In metal roofing the weak spot could be a poor weld, a rusted panel, or a screw that’s backed out. That’s not an issue with RHINO. Our strong, durable, rust-resistant, and attractive steel roofing panels are built to outlast Nature’s savage furies. Purlin bearing rib (PBR) sheathing is provided by RHINO as part of the standard package. RHINO’s roofing panels are constructed of 26-gauge high-tensile steel. Some building systems may use much lighter 28-gauge or 29-gauge steel panels. These are not considered to be commercial-grade products. For comparison, consider that a 26-gauge steel panel is about 26% heavier by weight than a 29-gauge panel. 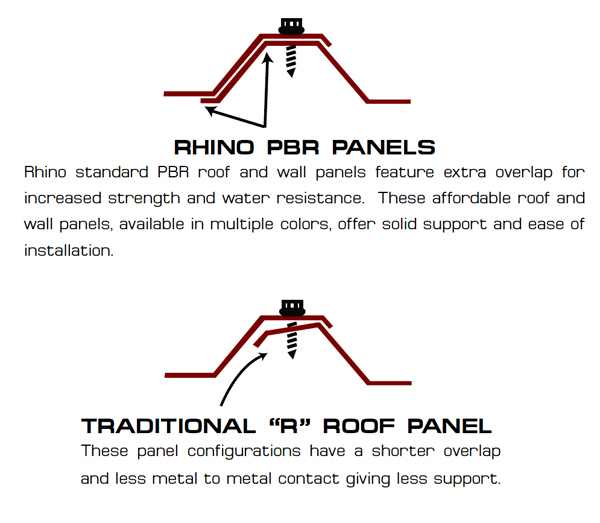 RHINO’s PBR steel roof system is shaped to overlap each sheet fully, providing an extra 1-1/4” of steel contact. (See illustration above.) The more metal that is overlapped, the stronger and more leak-resistant the connection will be. RHINO’s roofing panels come with a 25-year guarantee. Many of our competitors use an “R” type roof panels which only extend partially over the adjoining panel. This is not only a weaker connection than PBR panel, but can also allow strong winds to shove rain under the overlaps and into the building, causing massive leaking. 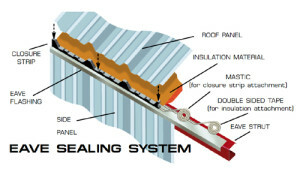 RHINO’s standard roofing also includes tape mastic, a caulk-like sealant used between two connecting roof panels for added waterproofing protection. The self-drilling cast zinc aluminum screws supplied by RHINO with all building kits come with a lifetime warranty against rust. Each screw includes a long-lasting EPDM (Ethylene Propylene Diene Monomer) washer which, when properly installed, delivers a waterproof seal even under severe weather conditions. The washer is impervious to ozone and ultraviolet damage. EPDM washers and self-drilling screws insure long lasting water damage protection on all RHINO metal buildings. RHINO’s die-formed steel ridge caps are formed to match the unique shape of the roof panels, so they fit together perfectly, forming metal-to-metal contact all along the cap. This provides a much tighter seal and improved pest control. Die-form ridge caps are included on all RHINO prefab steel buildings. For even greater waterproofing, RHINO includes tape mastic to doubly seal the ridge caps. Specially designed closure strips are used to seal the connection of the wall and roof panels on quality-made RHINO metal buildings. Closure strips are foam rubber strips shaped to exactly fit the profile of the roof panel. Applied with double-sided tape to the eave flashing, the closure strips seal wind, rain and insects out of the building. Closure strips for eaves, base, and roof are included in all RHINO packages. 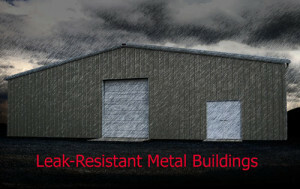 Ordinary metal building packages require a 1-1/2” notch be made in the concrete foundation all around the outer walls. The steel wall panels then rest directly on the concrete in the notch. This may cause the panel to rust over time when rain or moisture gathers in the notch. It may also allow rain to leak onto the building’s floor. 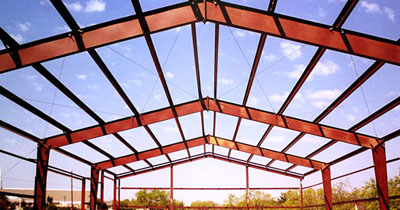 RHINO steel buildings employ a formed-base trim attached to the edge of the foundation. The wall panel then slips into the ledge of the formed-base trim, avoiding direct contact between the foundation and the steel wall panel. This system is not only more attractive, it’s much more leak-resistant. It also saves on concrete costs since the foundation notch doesn’t have to be formed. The formed-base trim is included at no extra cost on all RHINO buildings. Here are six other options you might consider for even greater protection from water damage. Gutters and downspouts work to protect your steel building by quickly channeling excess water away from the building and the foundation. You may choose to order steel gutters and downspouts from RHINO. They are available in attractive colors to match either the wall panels or the building trim. Approximately 60% of RHINO’s customers opt to include gutters and downspouts with their orders. Metal buildings are usually designed with the roof line and the outside walls flush at the eave. However, in some extreme weather locations, buyers choose to include overhangs, called canopies, on their buildings. Many clients prefer the look of canopies over standard buildings. Others choose overhangs to further protect the structure— and people— from rain, heavy snows, and ice. RHINO offers canopies as an option from 2’ to 10’ for sidewalls and from 1’ to 8’ on endwalls. Pricing will include soffit to enclose the underside of the overhangs. If your building will include plumbing, flues, or other pipes protruding through the roof, you’ll want to consider adding optional Dekities to your order. Dekities are strong yet flexible and durable “boots” which create a more waterproof seal around pipes than ordinary flashing. In extremely snowy locations, it is often wise to consider choosing a higher roof pitch for your metal building. This allows rainy downpours, snow, and ice to shed off your roof more quickly than on a flatter roof. RHINO’s standard buildings come in your choice of 1:12, 2:12, 3:12 or 4:12 rooflines. Higher pitches are available on customer orders. RHINO offers an optional 24-gauge steel standing seam roof panels for those want an even stronger, even more water-resistant roof. Standing seams steel roof panels are attached to the framing with clips that eliminate the need for screws to penetrate the panels. Less screws means less chances for leaks to develop in the building. Standing seam roof panels attach with specially made grooves, locking tightly together without the need for fasteners. 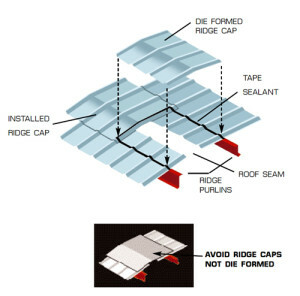 The only screws required are those attaching the matching ridge caps to the standing seam panels. We believe we have the finest, most waterproof steel buildings in the country. Call us today for a free quote or to discuss any questions you may have about RHINO steel buildings. Please call today at 940.383.9566. Share the post "7 Ways RHINO Metal Buildings Provide Better Waterproofing"